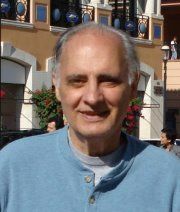 Richard we’re getting ready to file suit in Chicago over what we saw when we monitor the 5% audit recount. Can you give us your best analysis of what happened in Chicago that we could possibly plug into the lawsuit? Does that make sense to you? I’m an attorney and were in the final stages of drafting the complaint. We sawor rather have evidence of actual vote flipping from the early vote but if you have some analysis using examples that we could also possibly refer to in the lawsuit that might give us further strength. If you can get Cook County votes by precinct, I could do a Cumulative Vote Share analysis. Your comment is lacking in logic and shows that you are ignorant of basic polling facts. 1. In the exit poll Gender crosstab, pollsters Edison Research ask one question to males and females: WHO DID YOU VOTE FOR? 2. Edison Research asks the same question in Europe where the exit poll is considered accurate and is used to verify the vote count. If the discrepancy is greater than 2% from the recorded vote, there would be an immediate investigation. 3. All U.S. unadjusted exit polls are forced to match the recorded vote, regardless of the exit poll discrepancy. You had better do your homework on the basics of exit polling before your next comment on this blog. If your comment is as ridiculous as this one, it will never get posted. I find it funny how Sanders supporters rely so heavily on data that is irrelevant to the final outcome. Exit polls do give us a “guesstimate” of what the final outcome may look like, but exit polls has never been right, and they shouldn’t be looked at more than the final results. You’re also forgetting that caucuses has been proven to suppress many voters due to the fact that they take so long, so this hurts many working family and the elderly. For instance, Sanders won both the NE and WA caucuses, but Clinton won both of those states primaries even though no delegates were awarded in those primaries. What is important is, both of those primaries had more of an outcome than the caucuses. This data that you outlined is just bunch of numbers that looks aesthetically to Sanders supporters eyes, but do not mean anything in terms of reality. Nope. Exit polls are close to the true vote. The votes are fraudulent. So you are just another exit poll naysayer. I suppose the state and national unadjusted exit polls were wrong in 2000 and 2004 when they indicated that Gore and Kerry won in landslides. Of course, you probably believe Bush won both elections, since he won the recorded vote, which you feel is sacrosanct. Now, did Clinton do better in the primaries than the caucuses? Probably, since primary voting is corrupted by maliciously coded voting machines and central tabulators. Nick- exit polls are used by the UN to determine fraud. Any discrepancy that is greater than 2% is considered too great for the US to recognize the election as “fair” they are not a guesstimation, but in fact an extremely reliable source of the actual vote. I find it funny how Clinton supporters refuse to see election fraud, voter suppression or DNC bias despite the admissions by secretaries of state (AZ) and election board officials (NY), lawsuits, hearings, purged voters, flipped registrations, etc. Sander’s “hand-counted share exceeds his machine-counted share in EVERY CA county.” Just that fact alone smacks of foul-play. To those that refuse to see it, I fear there is nothing that will convince them. Who’s with her? Iceberg with her! https://www.facebook.com/photo.php?fbid=1050163631719863&set=gm.1550256731948870&type=3 After the Discount of every ideal, in the midst of the “self-declared” Democratic Party, they will experience the biggest loss in modern history. True Democrats don’t elect Crooks. I would be happy to answer your question. I was a Precinct Captain so I have some experience in Washington. The Caucuses are counted right in front of the voters and the tally is announced announced immediately to the voters. There is a paper trail and there can be a recount with voters representing both candidates overseeing the count. You will notice that Bernie Sanders carried the day in Caucus states. Could it be that there is no machines to tamper with? The primary subsequently held in Washington had no meaning. It was a beauty contest and was not recognized by the democratic party. The people who voted for a presidential candidate in that primary were ill informed. Exit polls have been correct to within 4%. The GOP exit polls have all been correct to well within 4%. The Democrats exit polls have mostly been off by between 8% to as much as an incredible 33%. If the exit polls are not accurate, they should be off by roughly equal amounts for both Hillary and Sanders. The actual votes have been less for Sanders than the exit polls indicate in 24 of 26 primaries. The odds of that are 1 in 190K. In countries where exit polls are off by more than 4%, it is grounds to suspect election fraud and launch an investigation. 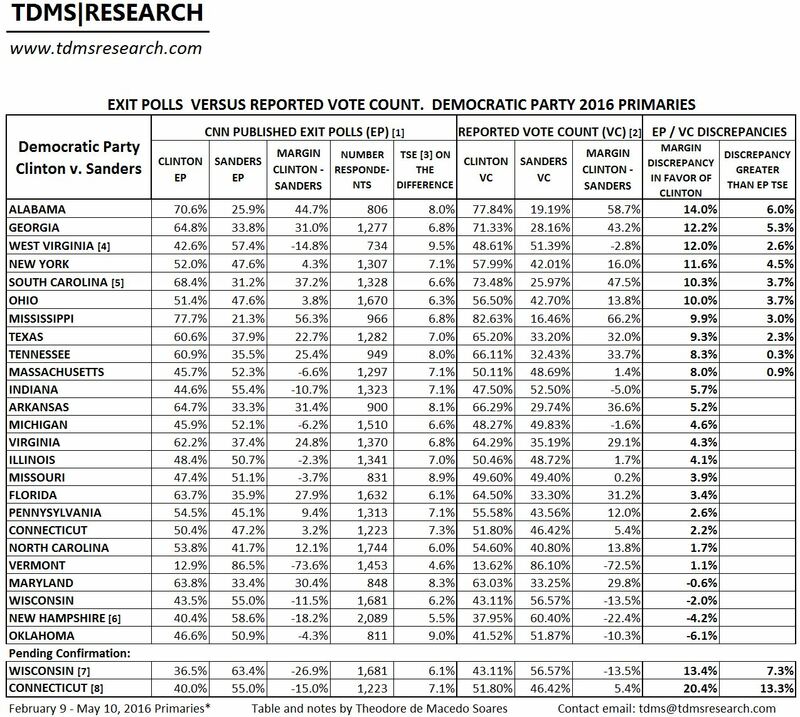 It is virtually impossible for the GOP exit polls to be off by less than 4% while the vast majority of exit polls for Democrats are off by as much as 33%. comes down to the fact that none of this matters when the watchers counters and prosecutors are all part of the theft. theirs nobody to turn to and any actions will be to slow to matter. Will we be able to actually get Bernie’s real votes to count in this election and have it as a legal authentic win for him? The DNC has to be sued as well as who’s behind all this cheating. We have to find a way to vote without these machines that can be manipulated. I really want the truth to stick and be counted. I feel very uneasy about all of this . I feel like we’ll we know but what can be done for Justice. anyone notice msm pressuring bernie to drop out and endorse hillary? i guess if he does that, the hand count would end….i stand with bernie! Is this true?I will really appreciate if you can respond. I already responded to Nate Cohn. Do not believe anything he says. Richard Charnin, thank you for your work on this. I see your response to Nick Crosby, but not to Nate Cohn. Am I overlooking it? If you read my blog, you will see my response to Nate Cohn. Thank you. Typo will now be fixed. This is brilliant. But can you explain to me how you know Bernie won 70% of the uncounted votes? It is an estimate based on the analysis of provisional ballots discarded, uncounted, shredded or whited out (see California). Your True Vote Model has Sanders at 51.88%. What does your model have for Clinton and Other? Green Papers popular vote has Clinton 55.2%, Sanders 43.14%, Other 1.66%. Does your True Vote Model relate at all to those figures? The True Vote Model is based on caucuses, exit polled and other primaries.